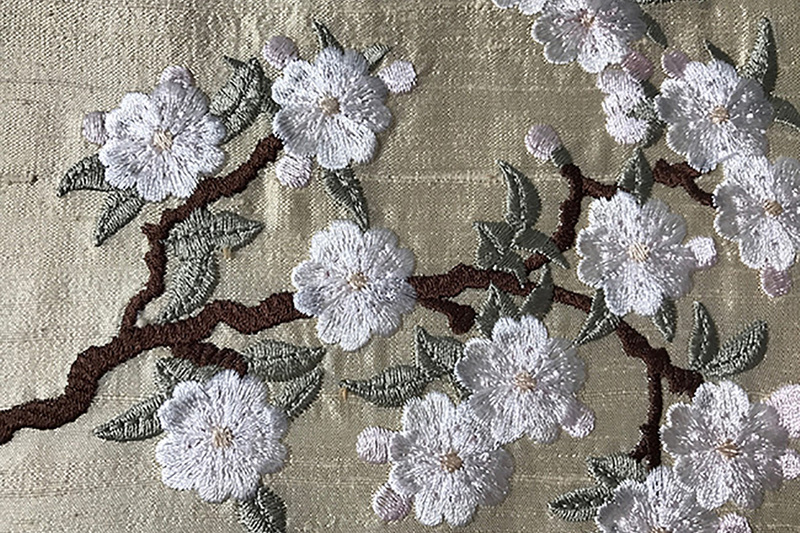 The Japanese Blossoms collection has 38 designs which will allow you to create a stunning embroidery. These pretty blossoms and leaves contrast with the gnarled branches. 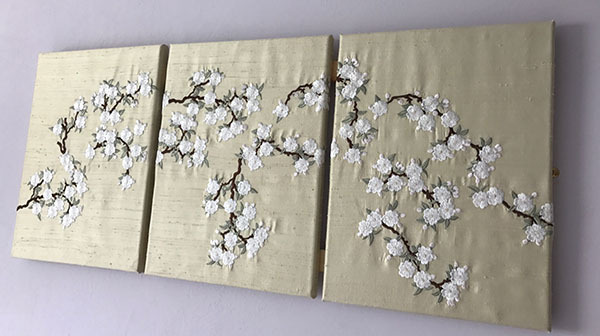 Since I completed my triptych I have discovered the beauty of silk thread, but I haven’t the heart to restitch it again as my husband has mounted the three canvases on a frame so they sit perfectly on my bedroom wall. During this month (July 2017) the collection is available for just $35 and I have been asked by several customers which designs I used. Starting on the left I placed the designs to move over the three canvases like a branch. My combination of designs however is just one of many so don’t feel you must copy mine exactly. I confess that I do look up at mine occasionally and want to re position them! Take some time to study some branches of a tree near you. It is important to start your branch nearest its trunk and follow the natural growth of the branch to its extremity. When I embroidered my triptych although it went through some planning I let it develop its own growth and I did make adjustments to it. You could consider attaching hinges to your canvases to make a beautiful hinged screen which is what I always wanted to do, but I never found the right hinges. To take you through the design I used in the right sequence is quite complicated so I have produced a tutorial along with a few extras designs. This embroidery was done with silk thread which is 50 wt so the embroidery is just a little more open. Using this thread is certainly worth the extra expense, but it will need to be kept out of direct sunlight. 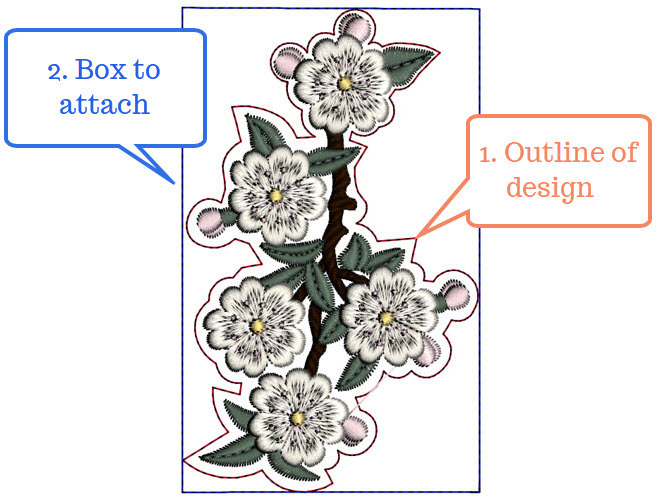 Both the left hand and central panels comprise of 6 designs but the right hand panel has a combination of 8 designs. 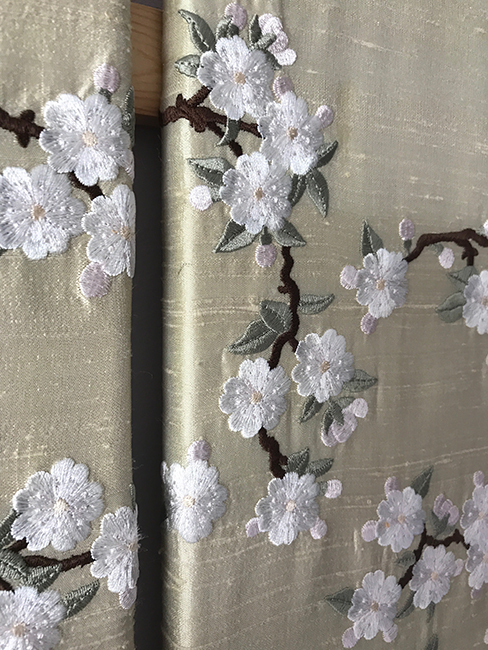 All the designs in the Japanese Blossoms collection come with and without my unique Outline alignment stitches (OAS). These are were first used at Graceful Embroidery for this triptych and have been added to most designs since. 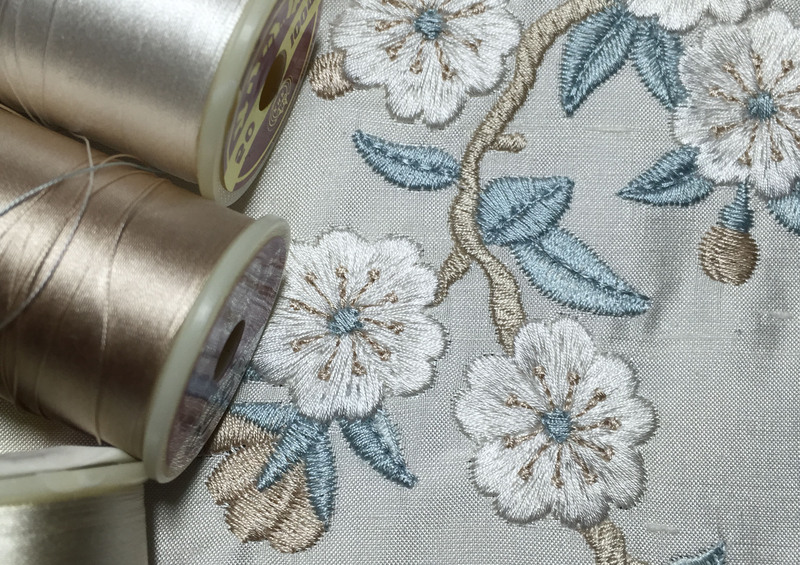 Naturally you don’t have to use Japanese Blossoms for your embroidery. If I was embroidering another triptych I would use my Celtic ivy designs and add some leaves as appliques. Another future collection, Orchids for Ruth would also be suitable and will be available in August this year. If you create one of these works of art, promise me you will send me pictures. This entry was posted in Discussing machine embroidery and tagged combining embroidery designs, embroidered triptych, embroidery on silk, machine embroidery, Outline alignment stitches, Placement of designs, tutorials. Bookmark the permalink.